I need a moment to emote. Would you mind lending an ear? Confession: Cloth diapers have been driving me absolutely bonkers for the last few weeks. The weekend I first started cloth diapers, Caroline ceremoniously had two massive poops in the first two cloth diapers I ever put on her bottom. It was good because starting out cloth diapering on the poopy side made the next couple months of my cloth diapering experience seem easy, almost carefree. When friends, a little skeptical of my ardor for cloth diapering, would ask how it was going I would tell them how easy I thought it was and how much I loved it. 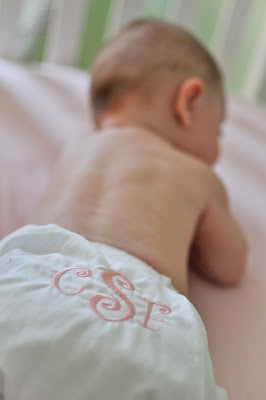 Yes, I loved cloth diapering. But then something happened. My infatuation turned into real life. It all started with the diaper rash that wouldn't go away, which ended up being a yeast problem with my cloth diapers. I spent hours scouring the internet for answers and measuring concoctions of natural cleaners. Literally the morning that problem was fixed I noticed mildew on my diapers. And with each wash and mildew destroying remedy it just spread. Thank goodness a friend who cloth diapers her son sent me instructions on how to strip BumGenius cloth diapers. It worked. Finally! And then I unintentionally made my cloth diapering problems worse. I decided to try a different brand of cloth diapers to see if I could get a better fit. Upon tearing open the package in the mail and racing upstairs to see if they fit my baby I was bummed, they seemed to be an even worse fit. Then genius me decides to post the ill fit on Facebook (because it's always smart to post your problems on Facebook before you've had a chance to think it through) and I had a dozen or so moms nicely and some not so nicely tell me I obviously didn't know how to use them to make them fit. Silly me, I thought my infant would need the diapers to be set on the "infant snaps" setting. Apparently she fits the newborn size snap sets instead. Why did I not think of this? Especially when she's still in 3 month clothes at almost 6 months? In honesty, I'm not sure I'm glad I figured out how to get them to fit because it means I can use them now, or disappointed because my no-cloth-diapers-fit-my-very-tiny-baby-excuse doesn't really work anymore. But I'm not giving up on cloth diapers. yet. Though I prefer the convenience of disposables I'm crunchy at heart and living granola often means doing things that are not convenient (like toting reusable bags around the mall and garnering strange looks from the department store ladies upon purchasing your items and shoveling them into a hemp woven carry-all). 1) It saves money. I don't remember the exact statistic but estimates say cloth diapering can save up to $2,000 per child. That might not seem like a lot to some people. But I'm not working outside the home to contribute money so any way I can save I take it. For me disposable diapers seem like more of a luxury. I think of each time I pop a cloth diaper on as a time I saved a quarter. It might not seem huge, but little steps add up to big changes. 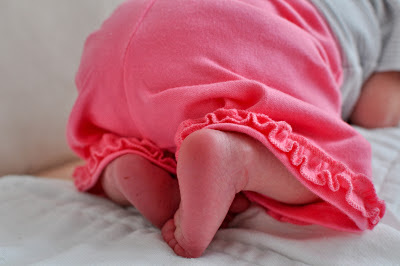 So where does that leave me on my cloth diapering journey? But wait, what? What about saving the polar bears and hazmat suits? I know, I know, I can sometimes be as crunchy as they come (for example I didn't shampoo my hair for a month when I joined the "no 'poo" movement, again another story for another day) but I realize that if I go insane from using cloth diapers (or suffer severe humiliation in front of cloth diapering pros as they inform me that my "cloth diapering safe detergent" actually has plant oils that may alter absorption) I will not be in the right mind to do more important things with my baby and raise her to know the perils of conventionally grown corn products. So I'm giving myself a couple of weeks and then I'll pull out those BumGenius and GroVia, wielding my diaper sprayer and show those poopy diapers whose boss. Here's to realizing and understanding our limits as moms and knowing it's okay to take a break when we need it. Oh and here's to saving the environment, that too. Any other moms out there have similar mommyhood experiences? I've been hoping to use cloth diapers when I have a baby but I've heard so many stories similar to yours that I don't know if I can bring myself to do it! But it would almost be worth it just to show all the people who look at me like I'm absolutely insane when I bring it up that they are wrong. :) hmm..
We're taking a one week break from cloth diapering because my almost two year old developed a horrible yeast infection. I never realized how bulky our cloth diapers are on my baby. I can't wait to get back to cloth, though. I hate the waste of the disposables. I was nice, though, to not have to wash diapers last night! I absolutely loved cloth diapering, but needed a break after my daughter got a rash that would not go away. I am now back in them (well, she is, ha) but I needed the break after the aggravating mess of trying to get rid of the infection in the diapers. I felt like a traitor when people would email me for advice and I knew she was not in them at the time! Glad you let yourself take a break. That's one of the hardest things about motherhood - believing the absolutes. We have been using expensive diapers for our baby since her birth . One time when the shipment got a little late, we had to use Honest diapers and my wife really liked them and ever since we stayed with Honest. Diapers varies as your child grows up. There are different diapers fir different age group children. Hey Bethany, I was looking at your blog tonight and just read this post for the first time :) We have a love hate relationship with them too! I have had problems with ammonia build up in the inserts which gives K ammonia burn on his bottom. It literally looks like a burn! So I quit for the whole summer. I just started back, but we have the same problem. Someone suggested that I boil our diapers, but I DO NOT have a pot big enough to boil???? my diapers. So...still a love hate thing :) All that to say, I feel you girl! love, Jenn B. A great honest post about the pitfalls as well as the benefits.